Having pulled the plug on cable recently, I switched to Roku and discovered a world of programming I never knew existed. New options for short features, independent films and some very interesting documentaries caught my attention. I gradually became more and more curious about this type of storytelling and how it comes to life. For the inside scoop, I spent some time with Al Santana, a professional film and video producer, director, cinematographer, and editor. I first spied Al’s work about a year ago in Brooklyn during a screening of recent award-winning documentaries at Long Island University by area filmmakers. I knew he’d be able to tell me everything I wanted to know about docs. That Al produces, directs, shoots and edits is an extension of his early film school training at Staten Island Community College, and then Richmond College, also in Staten Island, NY. How much did you enjoy learning about filmmaking and specifically editing in the beginning? One of my first assignments was to construct a visual story from what used to be called “found footage.” This meant going around to various film labs and scrounging through barrels for discarded film, which then was free. It was cool! Creating a work of art based on found materials. We would grab as much as we could carry, bring it back to the editing room. We’d splice unrelated scenes together to tell a visual story that had a sense of flow and abstract meaning. This assignment was my first exposure to the magic of film editing and I learned a lot about motion and the temporal aspects of editing. I’m a Vietnam War era veteran who spent my military time stateside working as a dental laboratory technician, manufacturing all types of dental prosthesis. After my discharge in 1971, I attended college to become a dentist. To hasten entry into Downstate Medical Center, I took a six-credit filmmaking course as an elective. It was the only six-credit course being offered at the time. In this course I found an affinity with a process I had become familiar with working in the dental laboratory – sitting at a work bench for long hours, doing very finite work, trying to produce something from nothing. So your entry point came by way of quite a coincidental occurrence of events. Interesting! What’s your signature style as an editor and how do you approach a documentary project while maintaining awareness of its integrity and overarching story? I don’t think I have a signature style as an editor. It really depends on so many factors; one being whether the film is a sponsored or independent project. Usually on work for hire, the director or producer has established a particular style for the project that I, as editor, will try to adhere to. In my independent work, I develop a style based on audience, content and resources. What do you mean by ‘resources’? For instance, in making Durban 400, an independent film about activists of the same name who went to Durban South Africa to attend the 2001 UN World Conference Against Racism, as well as lobby delegates to address the issue of reparations for the Trans Atlantic Slave Trade, co-producer Iman Drammeh and I grappled with how to make a film about a conference engaging. which was an international coalition with one agenda: to get language into the final declaration that addressed slavery, colonialism, and the Trans Atlantic Slave Trade as crimes against humanity. I, on the other hand, wanted to take advantage of our time there and cover a broader swath, which would give us more options in editing. At the time of our departure to South Africa, we had not yet settled on a through-line (driving force) for the story. I did know, however, that our production methodology would be a combination of sound bites, narration and cinema verité footage*. That decision was based on limited resources. And typically many documentaries are formed this way, with events happening in real time and filmmakers not knowing what will transpire next. That’s got to be either very exciting or great cause for anxiety. For some it’s a bit of both. Iman and I patiently went with the flow. After a while on the ground experiencing the enormous scope of the conference it became clear to me that my approach was physically not going to work. After all, the crew was just the two of us and many events were happening simultaneously. So, we stuck with the group, shooting everything we could, knowing this film was going to be made in the editing room. Al, what are key fundamentals of producing documentaries that are different from, say, producing a fictional piece of work? What, if any, artistic liberties are allowed? One key fundamental of documentary filmmaking is truth telling. In docs, we’re often telling the stories of people who have entrusted their image to us. It’s important to honor that trust. As editors and producers we use b-roll (a.k.a. visual evidence) to support narration and/or on-camera statements to maintain verisimilitude – the appearance of truth – and keep the audience engaged. I view filmmaking as craft. Whether or not it rises to the level of art is up to audience and critics. In documentary film, the only rule is to be truthful. All other so-called rules can be subject to so-called artistic interpretation. Similarly in fiction; be true to the characters and to the story. Within those parameters there’s much fertile ground in which a filmmaker can play. What are other differences between producing a documentary and a narrative film? Another difference is length of production process. Depending on the kind of documentary it is, it can sometimes take years to make. Whereas it may take many years to finance a fiction film, but once in production, it can go fairly quickly. Your recent award-winning documentary, Salty Dog Blues, produced with partner Denise Belén Santiago, took quite a few years to complete. Salty Dog Blues took almost nine years to complete. 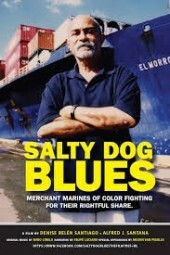 It’s about a group of retired merchant marines of color and their relationship to the now defunct National Maritime Union. Although the topic is of interest to many, as the U.S. 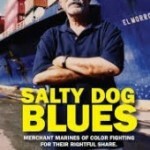 Merchant Marine provided upward economic mobility for many Puerto Ricans and African-Americans during the 1930s right on through the 1980s, and it’s a piece of maritime history not previously explored on film, the film remained underfunded. This meant spending time applying for grants, many with one-year funding cycles. If you didn’t get funding in the year you applied, you would have to wait a year to reapply. Also, our story was evolving and we had to ride it out. However, this isn’t uncommon for independent documentary films to have such an extended production cycle. When you’re editing a documentary, do you consider the emotions of the audience – how you want them to feel by giving emphasis to things that might not have otherwise been noted, or creating a subconscious emotional connection – in terms of assembling shots and dialogue into a coherent sequence? Editing is a craft, and the object is to entertain an audience. I mean entertain as in to keep engaged, not necessarily to amuse, although amusement is sometimes a good thing, too. So yes, of course I take into account the emotional aspects of a story when building scenes. In documentary films, I find the best and most genuine emotional content comes from within the internal narrative of the participants or subjects. However, there are many instances where I use the external tools of the craft – the cut, music, visual effects, and camera moves, to provide emotional connections with the audience. Sometimes juxtaposing opposing viewpoints can create a sense of drama and achieve an emotional tic if that’s what the story needs. Isn’t the ultimate goal of a documentary to educate and inform an audience about real social, cultural, economic or political issues? And that fiction is about characters, drama, inner and external conflict? I used to think the goal of a documentary is only to educate or inform, but those lines have become blurred. Fiction and non-fiction now contain many of the same elements. Motion pictures, television and film have become like a double mirror reflection of society. It’s a reflection of a reflection; where realty and fantasy exist side-by–side, becoming harder to tell the difference as audiences influenced by what they see in fiction films emulate that behavior, then documentarians record that behavior as reality. Are there specific contractual agreements that must be followed? Does the subject of a documentary have final approval prior to releasing the film? The subjects of my documentaries do not have final approval before its release. It would not be considered an independent project if they did. Before shooting begins, there is usually a mutual understanding and respect for the process that avoids misunderstanding. Once we’ve vetted the subject through a pre-interview to establish appropriateness of someone or a group as a spokesperson on an issue, we present them with a release form which gives us rights to include them in the documentary and exploit their image and utterances in the context of this film, to various markets i.e. cable TV, theatrical, foreign and domestic. Along with release forms, E&O (errors and omissions) insurance is required by certain broadcasters to limit their liability in case of a law suite. Why do you think there isn’t more recognition of the significance of good, solid editing? I think editors are sorely underrated. That said, film editing is often referred to as the “invisible art” because when it’s done well, the viewer can become so engaged that he or she isn’t even aware of the editor’s work. I think there’s much recognition given to editors, especially within the industry. One has to remember that within the Hollywood system, the stars are the ones generating the income. That’s why they make so much money and get so much public recognition. When they receive their awards, you notice they always like to thank the “little people” – the ones behind the scenes – that pull it all together. The larger body of your work is documentaries. What about this category of filmmaking resonates with you? For me it’s all about the story. Whether it’s documentary or narrative is not that important to me. I love narrative films as much as docs. 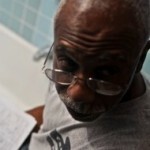 I’ve directed two narrative shorts One People and Flush. The reason for the bulk of my work being docs is that it requires fewer resources to produce. What I like about docs, especially social issue docs, is the opportunity to engage with real people, to be able to have them tell their stories and for me to learn about their issues, struggles and triumphs. I think most of the filmmakers that I associate with are hopeful that our films will make a difference in making the world a better place. What’s been your most enjoyable or most moving project to date? That’s a hard question to answer. I’ve learned and enjoyed all the projects I’ve worked on as cinematographer, editor, and producer/director. The reason the question is hard for me to answer is that I’m always looking forward to the next film. I’ve had many adventures traveling the world, shooting documentaries about everything from land struggles in Africa to animal sanctuaries in the Galapagos Islands. That said, I’m now developing my first feature length fiction film. It’s titled VIGILANCE. It takes place in Brooklyn. I’m not at liberty to say any more about it at this time. Readers can follow me on Facebook. I’ll post progress reports and also direct them to a website which will include a production diary. It would be very interesting to read your production diary! At this stage in your accomplished career, do projects come to you or do you seek them out? These days I’m generating most of my work. However, I do, from time to time, get requests to shoot or edit industrial pieces, which I enjoy. What about projects where you’ve been the director, cinematographer, editor and producer – how does the collaborative aspect of the work happen if you’re a one-man band? There are many more jobs that are required in film production, other than producing, editing, directing and shooting. We need writers, executive producers, production managers, scenics, script supervisors, grips, sound recordist and boom operators. The list can go on. There’s plenty of room for collaboration. But … as technology continues to advance, cameras, lighting and grip gears are getting smaller and lighter, and large crews are becoming less necessary. The division of labor is being impacted, but just as some of the old jobs are being eliminated, new ones are popping up. The downside? The industry is also now requiring many more skills from individual workers. For instance, my first full-time job as a cinematographer was with a public TV station. I shot documentaries and public affairs shows. Our crew consisted of myself, a camera assistant, a sound recordist, a production assistant and a producer/director. I recently noticed some of the news people out in the street these days are reporter/producer/camera operator/sound recordist/driver/editor. That’s crazy. Many jobs were lost. Same for the post production side where there were assistant editors, editors, graphics and audio post. Now one guy/gal has to know everything. So, to a certain extent, the industry is driving this breakdown in the division of labor and creating this “one-man-band” scenario. On the other hand, it’s also hard for me working as an independent one-man-band. I’d much rather be surrounded by qualified, creative and technical people. Sometimes the budget isn’t there for me to hire a crew, as in the case of Durban 400. Whenever I can, I do it because the work is that much easier and a whole lot more fun with people you trust. I’m a Brooklyn/Queens kid and a Brooklyn adult. What was your family life like? Did your parents or brothers and sisters dabble in storytelling in one form or another? Yes, my father was an amateur photographer who liked to show 8mm films, mainly cartoons, to us when we were kids. Both my mom and dad loved arts and crafts. My mom was a seamstress in her youth. She made clothes for me and my siblings when we were young. She also makes quilts, does needle point, plays piano. You often speak to students and aspiring editors, producers and filmmakers. What are the main two or three things you try to get across to your audiences that always remain in the forefront of your mind? One: that it’s all about the story. Content is king. All of this technological advancement will allow you to facilitate a story, but you better understand the statement your story is making. Two: process is everything. You will not get where you want to go without preparation and going through process. Three: be courageous. Don’t let fear paralyze you. “A journey of purposeful enlightenment…” That says it all. Thanks so much for your comments! VERY interesting – and insightful. I was fully engaged. Would like to see another photo or two! Does Race Affect Your Hospital Stay?